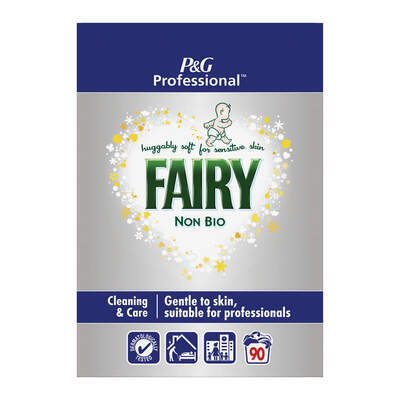 Formulated specifically for those with sensitive or young skin, the Fairy Non Bio Powder 5.8kg 90 Wash provides XXXL size at an economical price. This multi-purpose powder is suitable for use on both white and coloured fabrics and utilises an advanced surfactant system which powers through even on short cycles. Effective at low temperature, the special formulation brings your clothes and linen back to the cushioned softness you once loved while making every load easy to iron. Producing brilliantly clean laundry, it is also packed with brightening agents and an activated oxygen bleach system to get your whites whiter and your colours vibrant. A great option for busy residential environments or other environments where the washing machine is always whirring, choose Fairy Non Bio today. Suitable for use on sensitive and young skin, including newborns. Here at Gompels, we stock a wide range of Laundry Detergent options alongside this Fairy Non Bio from our own brand Gompels Bio Laundry Liquid 10l through to the Ariel Antibacterial Powder 105 Washing Powder.